Theaster Gates, Soul Food Rickshaw for Sitting, 2012. 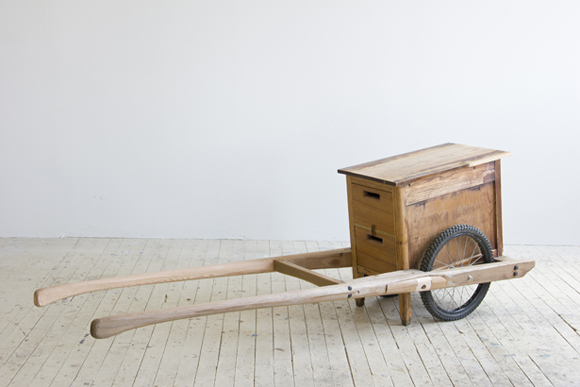 Wood and wheels, 98 x 33 1/4 x 26 inches. Courtesy Kavi Gupta Chicago / Berlin, Photo: Young Sun Han. Now celebrating its 15th year of exhibiting experimental contemporary art, Locust Projects is pleased to present Soul Manufacturing Corporation by Chicago-based artist Theaster Gates, whose critically acclaimed installation 12 Ballads for Huguenot House was recently featured in dOCUMENTA (13) in Kassel, Germany. For the first gallery exhibition of this multi-disciplinary project, Gates will create a factory consisting of four pavilions, occupied by “skilled makers” who will work in Locust Projects’ main gallery. Beginning with an empty space, the ”skilled makers” will produce “things” through the duration of the exhibition. In tandem with the production of objects, Soul Manufacturing Corporation will host programs by a yoga instructor, a DJ, and a reader, all there to care for the makers and the audience. Inspiration for this programming stems from the lectors who presented news, politics, and literature to illiterate workers in the early industrial era. Soul Manufacturing Corporation is a multi-city initiative based in Chicago, working with the urban redevelopment organization Rebuild Foundation on the creative re-use of buildings throughout communities of color. The project navigates the dense relationships between aesthetics, labor and race. The exhibition will also include sculptural and two-dimensional works created with up-cycled materials sourced from sites in Chicago and Miami, underscoring Gates’ interest in the poetics of re-purposed and salvaged materials. Concurrently, Locust Projects will present Wound, Bound, Tied and Knotted, new work by Jacin Giordano in the Project Room. Building on the organic dimensionality of the tree branches that form his stretchers, Giordano wraps and weaves webs of multicolored yarn to create his painting surface. Coated with layers of acrylic paint and dye, the paintings extend to the wall of the Project Room, giving the impression of a bas-relief sculpture. New artwork by New York-based painter Nicole Eisenman will be posted on bus shelters throughout the city in November/December 2012 courtesy of the Bus Shelter Project, Locust Projects’ public art initiative. Intentions continues the artist’s series of playfully erudite collaged monotypes that nod to art history. In it, a gestural white-on-black portrait, resembling one of Calder’s drawings in wire, is framed by a greasy golden halo. The face is flanked by two collaged totems, each a stack of cut-out figures gleaned from pop culture and high culture, coded hieroglyphics that ask the viewer to “read” the image as they roll by. 2013 marks the 15th anniversary of Locust Projects, a not-for-profit exhibition space founded by three Miami artists in order to provide contemporary visual artists the freedom to experiment with new ideas and methods without the limitations of conventional exhibition spaces. Artists are encouraged to create site-specific installations as an extension of their representative work, and Locust Projects offers them a vibrant Miami experience to develop their ideas. Locust Projects is committed to offering an approachable and inviting venue for the Miami and international art community to experience the work and meet the artists. Locust Projects’ exhibitions and programming are made possible with support from The Andy Warhol Foundation for the Visual Arts; Cowles Charitable Trust; Foundation for Contemporary Arts; Hannibal Cox Jr. Foundation; John S. and James L. Knight Foundation; Miami-Dade County Department of Cultural Affairs, the Cultural Affairs Council, the Mayor, and the Miami-Dade County Board of County Commissioners; Miami Sports and Exhibition Authority. Theaster Gates: Soul Manufacturing Corporation was made possible with major support from: Kavi Gupta CHICAGO | BERLIN, White Cube, London and Northern Trust. For further information please contact info [​at​] locustprojects.org.